This is a topic to which I would normally respond at considerable length. However, and even though the one-year mark from the Iowa caucuses (February 3, 2020) has passed, I think there will be more candidates emerging for the 2020 Democratic nomination for president of the United States. (Some, from Ronald’s list, have not declared.) 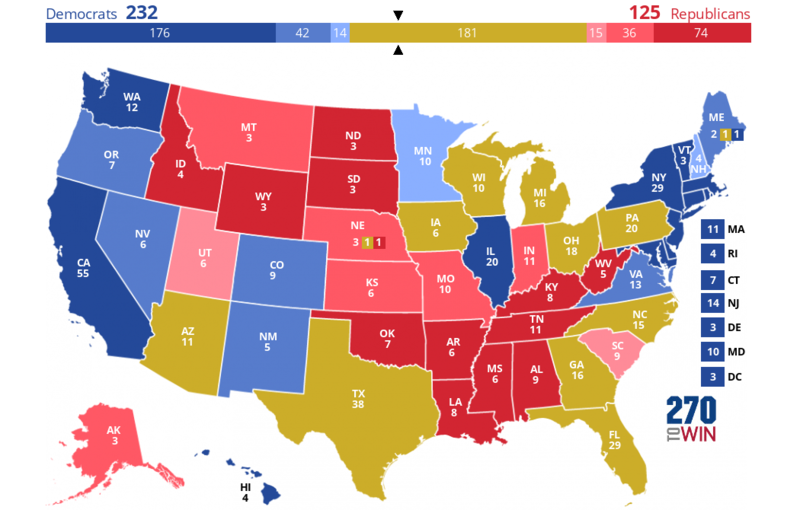 So, for this particular topic, I am going to address something else: the status of the electoral map. Since 1992, the range of carried states have numbered between 26 and 32. A 1992 and 1996 Bill Clinton (D–Arkansas) carried 32 and 31 states. A 2000 and 2004 George W. Bush (R–Texas) carried 30 and 31 states. A 2008 and 2012 Barack Obama (D–Illinois) carried 28 and 26 states. A 2016 Donald Trump (R–New York) carried 30 states. From those seven thus far election cycles, the combined average were 29 carried states. In Ronald’s blog entry, “Ohio, Illinois, Missouri, Nevada, and New Mexico: The Five Most Predictable States in Presidential Elections in American History,” (September 15, 2018, http://www.theprogressiveprofessor.com/?p=34829), I posted numerous comments to bring some insight into the historical record as well as some emerging trends. Thanks, D, for your projected electoral map. Representative Ilhan Omar got into a controversy concerning some tweets that were anti-Semitic. From what I’ve learned, support for Israel is complex and related to many more factors than just lobbyist money. The lesson for Omar is quite simple. She shouldn’t talk about Israel off the cuff, and certainly not on Twitter. It’s a complicated country, mired in a difficult conflict that tends to provoke emotional reactions on all sides. There are countless rhetorical landmines that are easy to step on. Yes, AIPAC and wealthy Israel-hawk donors like Sheldon Adelson have outsized power in Washington. Yes, it’s legitimate, indeed necessary, to criticize their influence. But there are ways to do that without evoking nasty tropes and stereotypes.